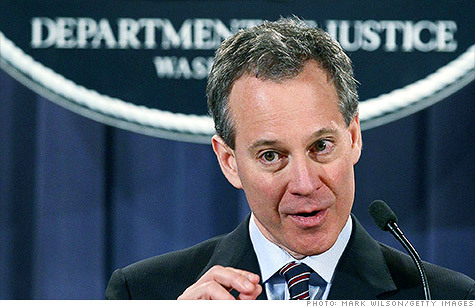 New York Attorney General Eric Schneiderman has joined with his counterpart in Connecticut to investigate Libor rate-rigging. NEW YORK (CNNMoney) -- The world's biggest banks, already under scrutiny from U.S. and U.K. regulators in the Libor rate-setting scandal, could soon face a flood of civil suits from numerous states. Spokespeople for the New York and Connecticut attorneys general confirmed Monday that their offices have conducted a joint investigation into the Libor scandal for several months. "The attorneys general will follow the evidence wherever it leads and with the goal of providing restitution to state agencies, municipalities, school districts and not-for-profit entities nationwide that may have been harmed by any illegal conduct," said Jaclyn Falkowski, spokeswoman for Connecticut attorney general George Jepsen. Officials with the Massachusetts and Florida attorneys general say their offices are also looking into allegations, although the Florida probe is not yet considered a formal investigation. The scandal concerning major banks misreporting the rates they pay to borrow from other banks broke into the open last month when Barclays (BCS) reached a settlement with U.S. and U.K. authorities to pay $453 million in penalties. Barclays admitted that its employees regularly manipulated Libor between 2007 and 2009, and that it was done at the request of traders at the bank and other banks. .
Barclays also admitted its employees conspired with other banks to manipulate the rate. Since then many of the world's major banks, including Deutsche Bank (DB), Royal Bank of Scotland (RBS), Credit Suisse (CS), Citigroup (C, Fortune 500), UBS (UBS) and JPMorgan Chase (JPM, Fortune 500) have disclosed that they are being investigated. Libor is a benchmark rate used to set the interest paid on an estimated $10 trillion in loans worldwide. But it is also used in the trading of about $350 trillion in derivatives. State and local governments potentially suffered the largest losses from the rate-rigging that took place, since many of them traded in those derivative contracts to protect themselves from rising interest rates. When the rates were pushed artificially low, as has been alleged, those local governments may have lost money. And some have already moved to recover those losses. Baltimore is the lead plaintiff in an investor class action suit against Barclays and numerous other major banks that claims the city lost money due to Libor manipulation. Brad Puffer, spokesman for Massachusetts attorney general Martha Coakley, said her office is working with other agencies around the state, such as the state transportation department, to determine any losses suffered as a result of rate rigging. The state attorneys general have a history of working together to win large settlements from various businesses accused of misconduct. Last year, they joined with federal authorities including the Securities and Exchange Commission to win a $228 million settlement from JPMorgan Chase and another $90.8 million from UBS related to misconduct in municipal bond derivatives. In February, 49 of the state attorneys generals joined in a $26 billion deal with five of the largest home lenders to settle allegations of misconduct in the foreclosure process.